I’m a little late with this, but I’ve been working on an impossible deadline for the past two weeks, so you’ll forgive me, I hope (and I’m still working on it, but a week must not go by without a new blog post!). Next year’s Giro (May 9-June 1) starts in Belfast. With all the recent Grand Tour starts in the UK and Ireland it’s not hard to see where the cycling money is in Europe these days. After a few days up there, the peloton flies down to the bottom of the boot for its long ride up the leg. There are plenty of mountain-top finishes (9), lots for the sprinters (8) and a couple of ITTs, plus one TTT. A nice mixed bag, I’d say. 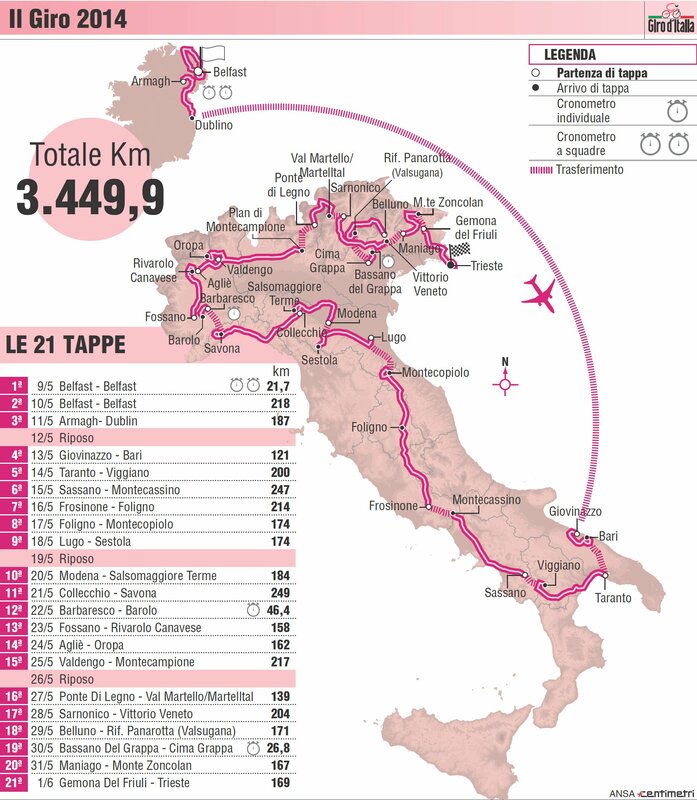 Proving that the organizers have a healthy sense of irony, coupled with the weirdest timing ever, next year’s Giro is dedicated to Marco Pantani, probably the most juiced-up rider of his generation, if you include off the bike as well. Still, I know I’ll be watching, maybe even live, if I’m deadline free in May. So why no Rome? Is it a political issue or just because it’s too much trouble logistically? Gerry, you have been missing in action! The gyro starting in Northern Ireland and finishing in Ireland should be a great one. Throw in a few pints of Guinness and this could make a trip to Dublin, to my wife’s stomping ground, very worthwhile. I’m glad Pat Mcquaid will not be welcoming the peloton to his home country. By the way, what do you think of Cookson doing a very good job of cleaning house. Seems all the cronies are quickly falling by the wayside. Now the director general and the lawyer for the UCI are gone. Very positive moves. Luc, I’m glad someone has missed me! I’m getting seriously fat after all this HR training/racing. How about you? Mark, thanks for the offer! I probably can’t get up there at that time, though, at least not next year. Very tempting, however…don’t rent out that spare room just yet!